Flower-heads about 4cm across with white or blue florets. Small, tufted perennial with dark green or purplish, grass-like leaves in a rosette. Widespread and frequent in swamps. A very handsome specimen well worth cultivating. Suitable below powerlines. Success from seed has been varied, fresh seed is vital. Surface sow. 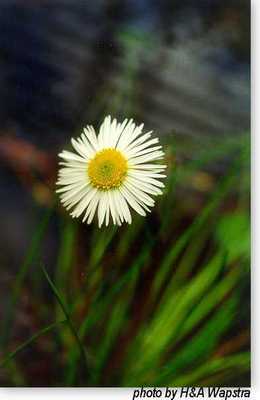 Best cultivated as a bog plant or in a pot with the base submerged in water. Prefers a sunny aspect.